Focus is an hairloss concealer. Focus is a unique complex of Keratin protein. These microscopic hair fibers build upon your existing hair to produce dramatic density and volume and total undetectable coverage to your thinning and balding areas. It is completely natural and effective. 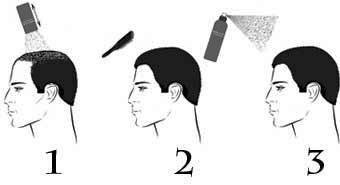 As you apply Focus to your scalp, you will see your thinning hair and bald patches vanish before your eyes. Focus Hair Building Fibers has succeeded in providing a product that satisfies everyone that wants to look young and feel beautiful. Your hair style can change with age and Focus Hair Building Fibers will promote any style you want. Say Goodbye to thinning hair and bald patches forever ! Focus Hair Building Fibers is made of Pure Organic Keratin Fibers. Charged with static electricity, these microscopic fibers build and accumulate upon your existing hair. Once applied, the fibers dramatically increase in density and volume. The coverage is totally undetectable to the naked eye. Your hair will look thicker and fuller in less than 30 seconds. The fibers, once applied, produce dramatic increase in density and volume. Yet, they produce a totally undetectable coverage of your thinning and balding areas to the naked eye. 1. Open and hold your bottle of Focus 4 to 5 inches above your head. 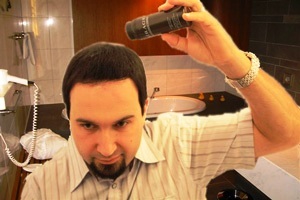 Shake gently your bottle as to release a small quantity of Focus Hair Fibers over bald or thinning hair spots. 2. Start styling your hair as desired. You can use a brush or comb to achieve the look that you want. Make sure that you have an even distribution of Focus Hair Fibers covering the problem area. 3. After applying Focus Hair Fibers, use any hair spray to lock fibers in place. Simply spray an even layer on to your hair for a long lasting hold and a great shine! Focus Hair Building Fiber is made from the same organic Keratin protein as your own naturally growing hair, so it's a completely safe, and a all-natural solution for both men and women. Is a fine spray specifically developed to increase the bond between Focus Fibers and thinning hairs. You may use your own hair spray for this purpose.